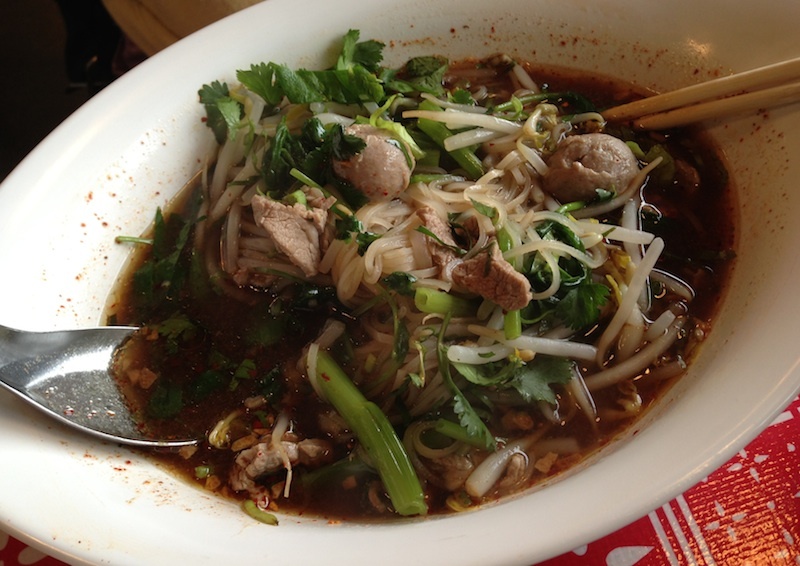 "Sen Yai specializes in Kuaytiaw, the noodle dishes of Thailand. Kuaytiaw is eaten at all times of the day; as a late night snack, economical dinner, a quick lunch on the run, even for breakfast." True to the Pok Pok ethos and like his other local eateries, Andy Ricker's brand new Sen Yai Noodles is packed with native vibe and lots of hard-to-pronounce items on the menu. To be clear, in my book that is a reason to run in, rather than away from, a restaurant. I also broke one of my cardinal rules when I visited, which is to give a new place a couple of months to work out kinks, settle in and get a groove going. But when the lovely and massively talented Ivy Manning called with an invite to check it out for lunch, how could I say no? Lots of other folks had the identical urge that day, and while there were plenty of seats available when we got there, within a few minutes every tiny table in the place was taken, with a line snaking out the door. Ivy's been to Thailand and knows its cuisine quite intimately, so I let her do the ordering. 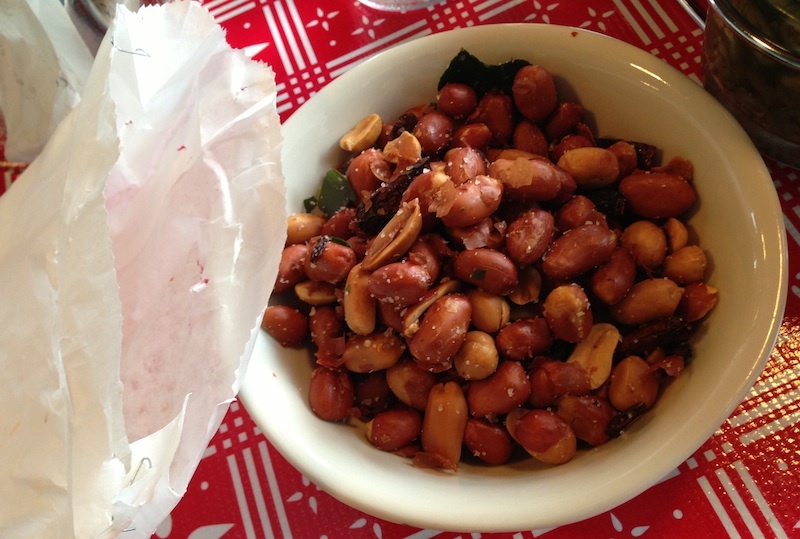 We started with the house-roasted red peanuts, which came as a small stapled packet containing the aforementioned peanuts along with lime leaf, chiles and salt…a crunchy, delicious teaser. Traditional Kuaytiaw Reua or "boat noodles" were a big hit, rice noodles in a complex, richly aromatic dark broth, three preparations of beef and "water spinach" (ipomoea aquatica) as well as dry-roasted chiles, herbs and bean sprouts. For noodle-heads this is a must-try and, though prices aren't cheap, the preparations are terrific. Details: Sen Yai Noodles, 3384 SE Division. 503-236-3573. Once again I broke the "don't go to a just-opened restaurant" rule when I decided to head up the hill to the just-opened Alberta Street Pub with the inimitable, estimable talents of Kevin Sandri (Garden State and Burgatroyd food carts) in the kitchen. I knew he'd been perfecting the stalwarts of any pub menu, a standout burger and fabulous fish'n'chips, and I wanted to stop in to both support him and check out the progress of his efforts. Along with my two favorite testers, my husband Dave and our son, both Sandri fanatics, we got the only three seats left in the bar, which was packed due to a crowd waiting to attend an evening concert in the attached performance space. 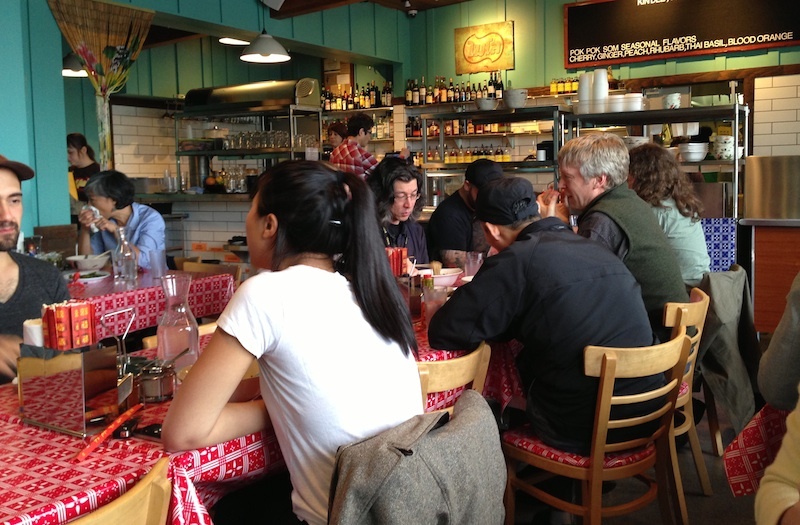 Sandri and his crew were handling the opening week pressure with aplomb, though, since our beverages and food orders popped out of the kitchen without delay. 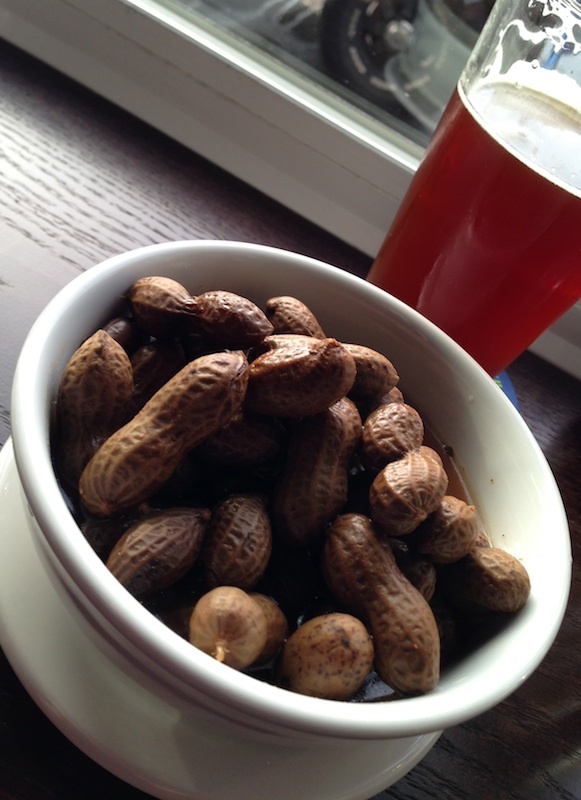 We started with the boiled peanuts, a treat Sandri came across while driving through North Portland, spotting a guy selling them on a corner. Immediately smitten, he'd been obsessively working on perfecting this Southern specialty for the menu. In their shells and soaking in a dark, salty broth, they were amazing, a soft, messy, delicious counterpart to the roasted peanuts I'd had at Sen Yai (see above). 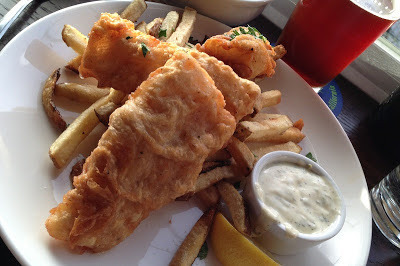 Even with Sandri's mad skills at hand, I was nervous about the fish'n'chips, having been disappointed at so many other places, but one look at the plate when it arrived and my fears were erased. Three good-sized pieces of delicately battered, perfectly cooked cod were resting comfortably on a pile of crispy hot fries, sided by a slightly sweet tarragon and dill-inflected tartar sauce. And it goes without saying that the porchetta sandwich, pork shoulder and belly with salsa verde, mayo and arugula, was sublime given Sandri's sterling meat cred. 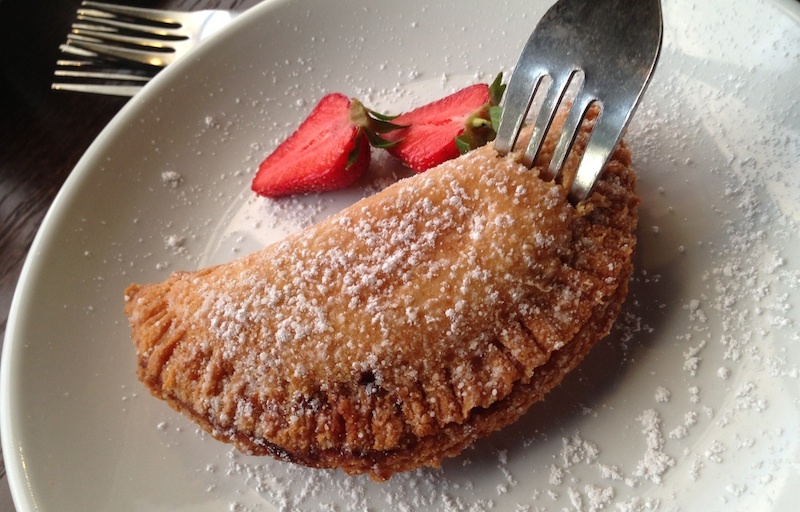 We even sprang for the Whiffies fried hand pie filled with local strawberries, a treat I'll be remembering for a long, long time. I can only hope that Mr. Sandri decides to stay in this kitchen for an equally long, long time. Details: Alberta Street Pub, 1036 NE Alberta St. 503-284-7665. More meat is good meat in my book, especially when it comes from animals pasture-raised on a small family farm. Which is what drew me to the awning at the Buckman Farmers Market with a hand-lettered blackboard that read "Reister Farms." Well, that and the fact that I'd just run into Mark Doxtader of Tastebud, who was eagerly devouring a lamb kielbasa dog featured on that same blackboard. So with the attitude that if Mark likes it, I probably will, too, I wandered over. 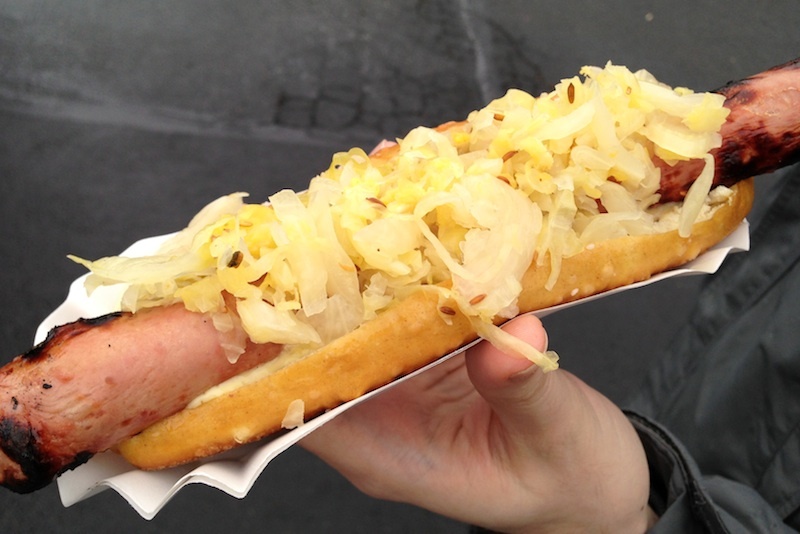 The dog, grilled before my eyes à la Foreman, was a hefty length of lamb innovatively wrapped in a pretzel roll from Fressen Artisan Bakery and smothered in fresh sauerkraut. The salty sturdiness of the roll was a great foil for the lamb and sauerkraut, and held together till the very last bite, a good test of any hot dog bun worthy of the name. I'm looking forward to getting to know more about the Reisters, who hail from Washougal, and their farm. In the meantime I'll be sampling their dogs and whatever other wares they're featuring the next time I'm at the market. Details: Reister Farms products can be found at the Buckman Farmers Market on Thursdays from 3-7 pm, at SE 20th & Salmon between SE Belmont and SE Hawthorne in the parking lot of Hinson Baptist Church.